Despite sophisticated industrial safety technology, many workers every year are injured in accidents while using the ladder. Falls in the workplace injure thousands of people each year, and many occur while workers are using ladders. A major cause of ladder accidents in the workplace is misjudgment of the ladder angle. If the worker sets the ladder too steeply, it can fall back during use, causing the worker to tumble off. 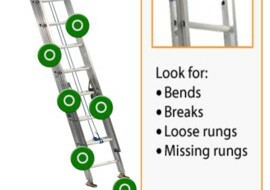 Or, if the angle is too small, the bottom of the ladder can slide out, causing a potentially serious fall. The National Institute for Occupational Safety and Health recently released a mobile app to help workers judge the angle correctly. The correct angle for setting a ladder is 75.5°, and any variations can increase the risk of a fall. The app is available in English and Spanish and is available for free download on iPhone, iPad and Android-powered devices. Workers who frequently use ladders, as well as their employers, will find the app very useful. An injury also can occur if a worker slips on the rungs of the ladder, climbs the ladder while carrying objects, or overreaches or touches electrical wires. In some cases, accidents occur because ladders are in poor condition. Make sure that the area is barricaded before you get on the ladder, to avoid the possibility that other workers may walk into the ladder when it is in use. Walk up the ladder carefully, holding on to the rungs, and maintain three points of contact on the ladder at all times. Avoid walking up a ladder holding objects in your arm. Use your tool belt, or hoist materials to get around this problem. Wear sturdy, comfortable boots with slip-resistant soles while climbing a ladder. Avoid climbing a ladder while wearing wet, muddy shoes. Inspect overhead for all electrical lines before setting up a ladder. Place the ladder on dry terrain that has high traction and not on a slippery surface. Set the ladder angle correctly.